The peanut butter sandwich, the go to for me when toddler is screaming or won’t eat. And Princess D loves them. She craves them, has major breakdowns when I can’t provide them and I really don’t know if I can get her out of the habit. To me they seemed like a healthy meal – quick and easy with some milk & carrot sticks to get all food groups there. We eat only natural peanut butter, with nothing but peanuts in it, and the bread is either whole wheat no sugar added or full on multi-grain goodness baked locally so it’s gone off in a week. I thought this was a good healthy snack / meal. But according to new research they’re not the best nut. According to Registered Holistic Nutritionist, Grace Van Berkum of Gracious Living, who is also my nutrition guru, peanuts aren’t the best nut. They’re very acidic and can throw the PH balance of your body off. Not a good thing for fighting disease. To the rescue comes the always fabulous Grace, with recommendations as to how to make that peanut butter sandwich healthier and her own Gracious Living recipe for Almond Butter. For those of you that don’t ever want to give up your peanut butter sandwiches (Miss Davis Grace Sophia! ), here are a few tips on how to make them healthier…but still yummy! -Read the labels!! Choose a bread that has no sugar added to it! Whole grain breads are better than white breads. Even better….Try a sprouted bread in the freezer section of your health food store, or Wholefoods. Eziekiel or Manna bread are some nice ones. Or try a German Dimpflimier bread with no sugar and no yeast. Whether you like creamy or chunky, make sure to…. (you’ve heard this before!) READ THE LABELS! Best peanut butter has 1 ingredient: peanuts! Stay away from anything that has hydrogenated oils or sugar added to it. They are both toxic, cause inflammation in the body, and slow down your metabolism. 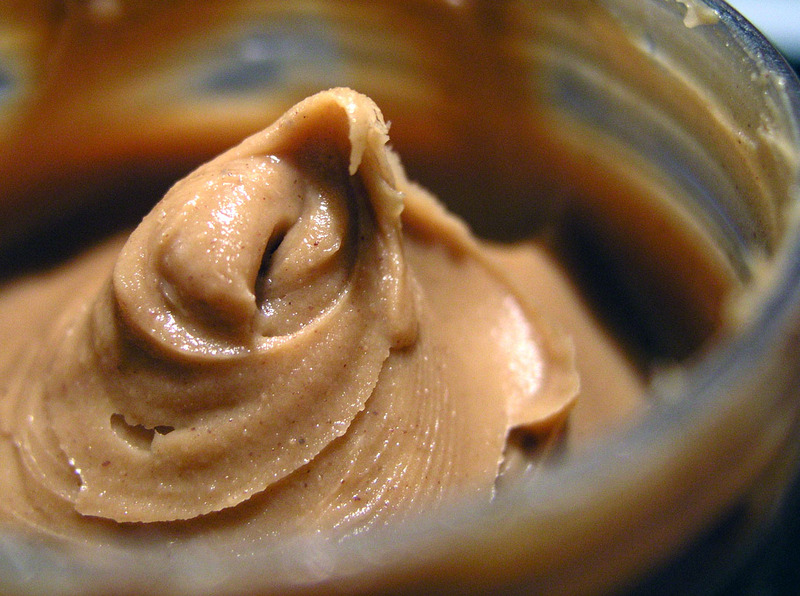 Buy your natural peanut butter from the supermarket or in bulk at the health food store. Place all the almonds in your food processor and blend for 8-10 minutes. Every 2-3 minutes you may need to stop the processor and use a spoon scrape down the sides of the bowl. At first the mixture will get crumbly. Just keep on processing because it will turn creamy! Once your almond butter is creamy add a pinch of sea salt. Store in an air tight container or jar in your refrigerator for up to a month. What do you think? Let me know if you try it and your nut monger likes the variations. And if you have a question for Grace let me know and I’ll pass it on. Look for Grace’s blogs every month on Seriously Single Absolutely Attached. Grace Van Berkum is a Registered Holistic Nutritionist, Sivananda Yoga Teacher, Certified Personal Trainer, and Recipe Creator from Toronto who is currently living in Nicaragua. She is passionate about increasing vitality, preventing disease, and cultivating inner peace through conscious eating, exercise, yoga and connecting to nature. Grace runs Gracious Living Empowering Yoga Adventure Retreats in Nicaragua, Bahamas, and around the world where she teaches her guidelines for healthy living. She is all about healing the body and healing the mind while enjoying the process. Still spots left for the AMAZING, LIFE CHANGING Gracious Living Yoga Nutrition Adventure Retreat on Ometepe Volcanic Island Nov 27-Dec 4, 2012! This entry was posted in Daily Dealings, Healthy Habits, Recipes and tagged almond butter recipe, eating healthy, eating with kids, grace van berkum, healthy foods, healthy foods for kids, peanut butter, raw food by njsullivan. Bookmark the permalink. clearly a princess. enjoyed the informative post. on the road to preparing healthier food….slowly but surely. you are inspiring. when i crack open a box of kraft mac and cheese, i hear your voice! OMG:) lol. that kd was our supper on sunday night… had my friend’s kids for 3 days so kiddies were ages 2, 3, 4 … which meant by sunday night when i had to get the house clean too i couldn’t manage another homemade healthy meal. did i feel guilty? you have no idea. a friend of mine actually told me it’s ok nikki… i apparently needed the reassurance that one out of 9 meals not healthy was ok.
Love the tips. My kids are pretty good eaters, but once a week, a peanut butter sandwich calls their name. Thanks for the recipe for almond butter. We’ve purchased it at grocery stores, but I’ve never thought to make it before. Great ideas. it’s so much cheaper to make these things Kathy, and did you know you should keep your nuts & seeds in the fridge or freezer? the lovely grace taught me this … chia seeds are the only ones that don’t need to because they won’t go off, they’re so high in antioxidants. Pingback: Gracious Living Raw Fudge Monkey Bars | Gracious Living Nutrition & Yoga with Grace Van Berkum, R.H.N. Pingback: Gracious Living Chocolate Mint Pistachio Squares (raw, vegan) | Gracious Living Nutrition & Yoga with Grace Van Berkum, R.H.N.